Forget De Niro and Pacino, because Sacha Baron Cohen may just be the best actor in the world. It’s one thing to be a great actor, immersing yourself completely in the character, when surrounded by other actors and working from a script. It’s quite another to do so with Joe Public, improvising your lines and keeping up the pretence while actually managing to keep a straight face. 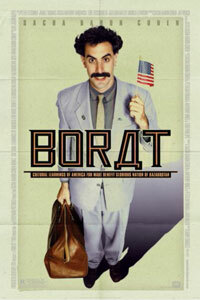 Besides having possibly the best title in the world – Borat: Cultural Learnings of America for Make Benefit Glorious Nation of Kazakhstan – Cohen’s latest (I’ll just call it Borat for the sake of my typing fingers) is one of the funniest films of the last few years. When Empire say that it’ll prove as timeless as Airplane! and This is Spinal Tap, I really can’t argue. The format isn’t much different to the TV show and indeed some of the “interviews” could have been lifted from it, but this essentially adds a plot and goes further than the budget and taste constraints of television can allow. The fact that the credits name the provider of “Mr. Baron Cohen’s feces” (sic) goes some way in explaining it, as does the fact that Borat has the police called on him and is tackled by security guards on several occasions. Not always while clothed. You’ll know what part I’m talking about when you see it. It’s the part where the whole audience is crying with laughter. Some of the funniest parts come not from Cohen himself, but from the lines that people manage to come out with on their own, exposing very real prejudices – a cowboy tells Borat that he looks Islamic and that he can’t see a Muslim without wondering what kind of bomb they’re carrying, and on several occasions advice for Jew and gypsy-killing is rendered without hesitation. These moments are not only slightly frightening, but also among the funniest in that these are lines that would be shocking if it was a comedy creation like Borat who came out with them. While the film is offensive, it’s an equal-opportunities offender. Borat is racist, misogynistic, and totally anti-Semitic – in one scene he accuses a Jewish couple of transforming into cockroaches and throws money at them – but still manages to be endearing through sheer innocence. He does it because he doesn’t know any better rather than to be offensive. But even if one of the more outrageous outbursts hits a bit close to home for you, it stays good-natured and is still likely to be one of the funniest films you’ll see in ages.